Arvor boats have long held a real fascination to me. Shaftdrive boats are the norm amongst the professional fishing and skiboat fraternity but they never really gained widespread acceptance for other small boat applications. Yet shaftdrive has real appeal. 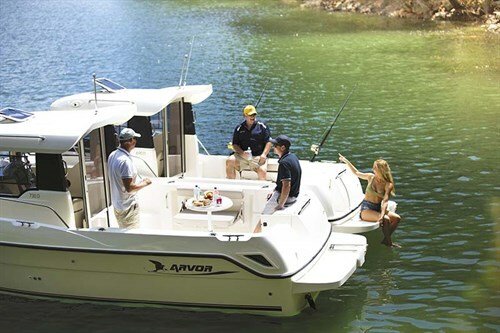 Arvor Boats have stuck to their guns with the benefits of shaftdrives with the new Arvor 730 Diesel and slightly smaller Arvor 690 Diesel, and done it in conjunction with the bonus of Mercury diesels. The new Arvor 730 Diesel follows the latest trend toward upright trawler style windscreens that boosts cabin room and enhances viewing from the helm. The Arvor 730 Diesel hull is not new but the overall design, power selection and layout certainly is. From stem to stern this is a very workable boat. It has a large boarding platform at the stern with a port side rear door for easy boarding. We met at Akuna Bay Marina on a glorious summer morning, immediately went to work putting the new boat through its paces, and eventually anchored up for lunch in a beautiful forest-lined cove. I loved the relaxing demeanor of the Arvor with shade in the cabin, a big vee-berth for a nanna nap, a small sink and single burner stove to make a hot cuppa, but plenty of deck space to enjoy the sun. The Arvor design has very full bows with strong shoulders creating an almost rounded foredeck with plenty of flotation. The foredeck is flat and very safe to navigate with its stainless steel split bowrail and upright cabin providing enclosure. You could easily throw lures at a thrashing school of tuna from the bow and fight a big one with sure footing. She has a fully moulded bowsprit with a Quick full chain electric windlass and anchor locker. Arvor provide big bollards in all the right places, a simple feature missing from so many competitors. 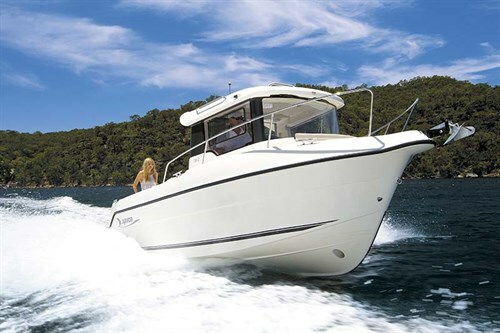 Shaftdrive boats do not allow good steerage in reverse, a factor that scares many would-be purchasers. However the addition of a bowthruster as standard has alleviated that concern, making low speed manoeuvrability and docking so much simpler. You will still need a little practice, but it won’t take you long to get the hang of it. 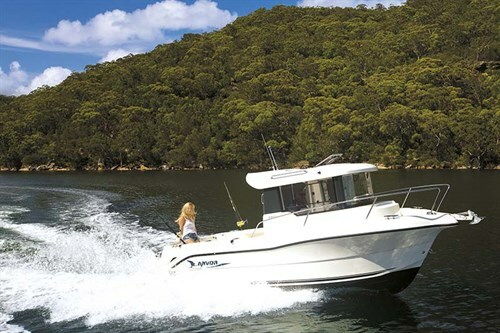 Whilst she’s no skiboat out of the hole, you will be pleasantly surprised by the performance, enhanced by the response from the Mercury diesel variable-geometry turbo. She takes a little while to get up on the plane but when she’s up there she’s got plenty of torque to hold her speed, even when climbing up the back of a large swell. She loves to cruise at a comfortable and economical speed of 17.5kts at 3600rpm with a fairly sweet diesel hum of around 88db(A) at the helm. Our brand new, not yet run-in engine tops out at Wide Open Throttle at a speedy 20.5kts at 4000rpm where she returned around 92db(A). I specifically checked noise levels on this test as many diesel engines can be horrendously noisy; however I found the Mercury fit-up and fully-lined enclosure to return a quite satisfying low pitched acoustic. The appeal of a diesel was amplified as soon as we rounded Barrenjoey headland and headed to sea. There’s nothing like confidence in your machinery when the land disappears over the horizon. The handling of the Arvor 730 Diesel takes a little getting used to. The moderate-vee hull, with big broad shoulders and ensuing deep chines, certainly pushes some water in a head sea. 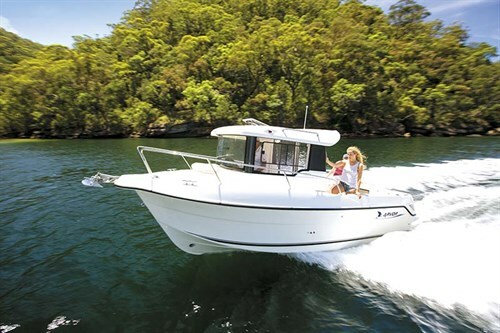 Moderate-vee shaftdrives simply don’t lean into a turn like a deep-vee outboard and the torque transfer from the big prop and rudder actually keeps the hull upright – a bit like driving a cat, or a three-wheeled motorbike. You can keep her running true and trim for differing loads and conditions with the standard Lenco trim tabs. Again, it’s not supposed to be a sportsboat and once you’re used to the character the package is certainly worthy of seagoing antics. The huge cockpit has deep freeboard and good gunwale height. It needs some customising according to your preference in cutting boards, rodholders, outriggers or tank racks but it’s a great base to work from. The cockpit is a fully enclosed fibreglass capsule with non-skid finish on all tread areas. There is a well-proportioned livebait tank with clear view inspection window in the middle of the transom. There’s also direct access to the rudder shaft which allows emergency steering override in the unlikely case of failure of the hydraulics. The deck drains to a pair of scuppers with their own channeling below the floor height to keep the deck dry and without feedback. There’s a neat pull-out dual upholstered seat to the starboard side that comes in very handy during a long day at sea, and recessed fishing rod storage to the port side. The side walls are dual-skinned, fully enclosed and foam-filled for maximum strength and safety, yet that does present some challenges for fitting extra accessories. She has underfloor storage/killtank to the port side, and a further hatch centre rear that takes you directly to the fuel tank, underfloor bilge with pump, and the main engine access is via a large opening hatch in the middle. Arvor Boats was one of the first production fibreglass boat builders to fit fully enclosed hardtops as standard. Its development is no overnight sensation and the latest offerings are quite beautiful and very functional. There is a small rear overhang, both front and rear, creating extra protection and the moulding is raised toward the rear so water runs off the sides and not all over your crew if you cop a bit of sea. Externally it has strong handholds for the walkarounds as well as navigation lights; however it’s also a terrific mounting point for extra customised accessories; perhaps even a life raft or water toy pack rack. There are two speakers inside and two outside the hardtop as well as independent LED drop lighting and a roof hatch, with more space available for added instruments and communications. The big windows provide a terrific viewing range from the comfort and security of the cabin. The curved safety glass windscreens have wipers each side and the large side windows have sliding inserts to help with ventilation. You enter the cabin through the sliding door that opens from the port side and step down past the small galley unit and then back up to the side by side driver and passenger seating. The fully upholstered swivel seats are on Softrider pedestals but even at full extension I found them a little low unless sitting up on the bolsters. I felt it was perhaps an opportunity lost for some under-seat storage. 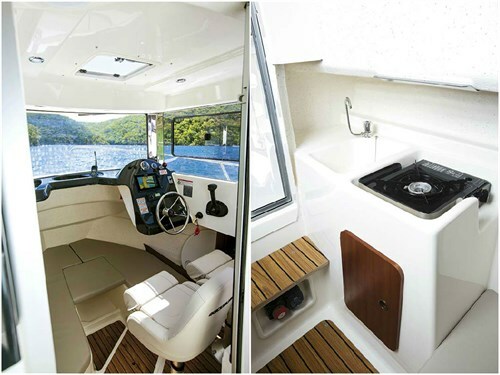 The head room is terrific and the compact dashboard is well presented with Smartcraft analogue and digital gauges, Simrad sounder-GPS-plotter, trim tab control, switch panel, Fusion sound system, Quick windlass switchgear and a trolling valve for precise low-speed engine control. The dash has a couple of storage trays for all your nick-nacks and it all presents well in the anti-glare black gelcoat finish. Arvor has designed a good amount of storage inside the cabin, most of it with nice faux-timber finishes. The drop-in cushions and fold-out base for the vee-berth inserts are quite unique and there is adequate space for a Porta Potti, although it wasn’t fitted to our demo unit. I must say that the number of different levels in the cabin floor had me scratching my head just a little, but it all seemed to work and really added to the available size and headroom throughout. Mercury Diesel 150, 3 passengers, full fuel. * Sea-trial data supplied by author. Almost all that can be said for the 730D can be repeated for the slightly smaller 690D. She obviously has a bit less overall volume, and yet has a large overall feel and ability. 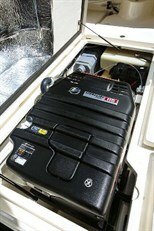 The smaller and lighter hull obviously needs less power and hence is fitted with the 115hp Mercury 2.0lt diesel.Other than the obvious size and horsepower considerations, the biggest difference between the two packages is that there are no thrusters, nor trim tabs fitted as standard and a slightly different cabin configuration on the smaller model. I’m quite used to handling shaft-drives so I don’t find it a problem with the absence of a thruster – however I can foresee that some would. I run the risk of sounding a little boorish when I say that most of those prospective purchasers may not have advanced to the world of Arvor in the first place. They are quite nimble and manoeuvrable at low speed in forward, and back up quite straight in reverse. We had no problems mooring in rather tight marina pens, nor doing quite tight circle work for the camera. Internally, the 690D has all of the features of the 730D, just a little smaller. There is still a large vee-berth that is extended with a combination of lift-out and folding inserts, creating quite some sleeping room. Arvor have maximised the available space by providing twin upholstered bolster-style seats, but this time mounted to a fibreglass storage module for extra storage facility. The 690 Diesel has no pressurised water as standard but there is a small sink recess next to the single burner butane stove compartment. The performance is also quite pleasing albeit a little tender in turns, with a Wide Open Throttle of 21.2kts at 3100rpm and plenty of diesel guts and confidence through the range. I must note that the engine is actually rated to a maximum 4000rpm and hence some further propeller development may improve items like holeshot even further. Mercury Diesel 115, 2 passengers, full fuel. Add it all up – enclosed hardtop, diesel shaftdrive, bowthrusters (Arvor 790 only), a comfortable vee-berth, small galley, a huge cockpit, easy walkaround with added bow seat, anchor winch, a tasteful selection of accessories as well as a terrific swimplatform in a great looking boat presenting real economy, safety and value for money. That’s the Arvor Diesels. Electronics pack, four speakers, Fusion Bluetooth stereo, 7in Simrad colour sounder-plotter-GPS, and baitboard. Electronics pack, four Sony speakers, Fusion Bluetooth stereo, 7in Simrad colour sounder-plotter-GPS, and baitboard. See the full version of this review in Trade-A-Boat #253, May / June 2015. Why not subscribe today?